The Hawks pulled off a big upset against the first place Ryerson Rams in a double overtime this past weekend, Improving the Hawks’ record to 14-9-4. 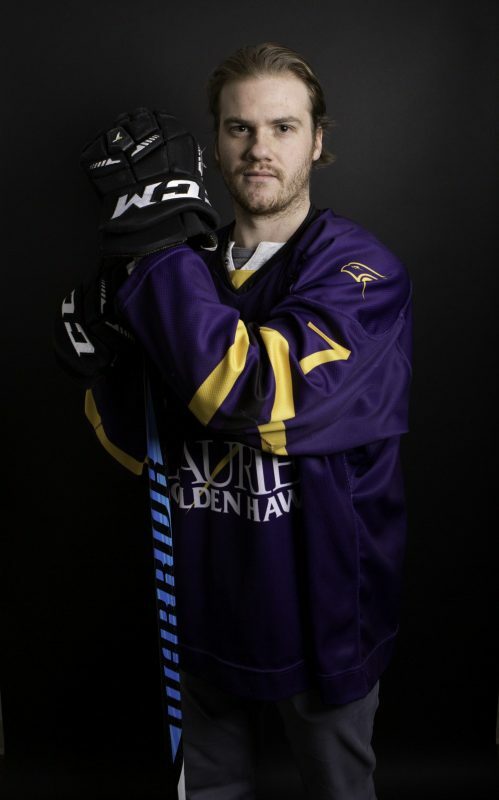 One of the key pieces of the Hawks’ success has been third-year right winger, Andrew Fritsch. His play earned him Laurier Athlete of the Week on January 30. Fritsch has contributed in a big way this season, scoring 11 goals, along with racking up 16 assists. The Brantford native spoke about the key to the Hawks’ success this season. “Individually, I think I’ve just been fortunate enough to be playing with good line-mates. We’ve been together the whole year; we haven’t separated once. Playing with other good players helps you do well individually. As a team we’re just trying to buy in. We’re rolling at the right time and I think we’re feeling pretty good right now going into our last game and into the playoffs,” he said. The win against Ryerson guaranteed the Hawks home ice advantage in the first round of the playoffs. This stipulation increased the magnitude of what already was a massive win. “The win was obviously important for home ice, but it was also important because it gives us some confidence that we can play with the top team. They are first place in our conference and we just beat them. This year, I think we’ve just about beaten every top team and it just gives us confidence that can we beat anyone,” Fritsch said. There are numerous first-year players on the Hawks’ roster, yet their record is much better than last year. This speaks volumes about the maturity and leadership on the team. Fritsch mentioned that this team is full of leaders. “We’ve got great leadership, starting with Kyle [Morrison], going down through the assistants. Everybody has a say; I don’t think it’s just the guys wearing the letters. Obviously they’re important and they do a great job. Everybody right from the first-year guys to the fifth-year guys has a say. When someone talks, we listen and we go from there. The first-year players have come in and done a tremendous job and that has definitely helped with our record,” he said. It’s easy for people to look ahead into the playoffs when a team has clinched home ice. But it’s important for the players not to overlook anyone. When asked to comment about the Hawks expectations for the playoffs, Fritsch reminded everyone not to look too far ahead. “We just want to take it game by game. Everybody’s goal in this league is to win a championship. But I don’t think we want to look too far ahead. We’re still trying to get better every day and if we continue to get better as a team, then our chances are going to be pretty good if we just go game by game,” he said. Fritsch brings a certain level headedness to this team. With players like Fritsch, this Golden Hawk squad can go as far as it wants to. It seems as if the Hawks have caught fire at just the perfect moment. They have now won four consecutive games and have climbed to third place in their conference. One can tell that the confidence is flowing through this team, as they head into their final regular season game against the Windsor Lancers. With the playoffs right around the corner, it’s an exciting time for the Hawks players, coaches and their fans.